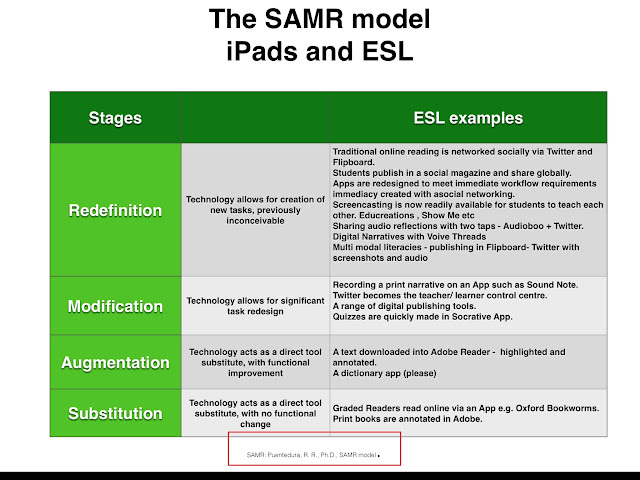 The SAMR model presents a framework to navigate when using iPads in ESL. The model provides an awareness to notice the stages of the journey for teachers and learners to personalize learning from enhancement to transformation. I have summarized the following examples from IPads in ESL. Refer table below (made in Keynote). I used this model to plan or reflect on my lessons. One day, I noticed the iPad transformed learning. There is a moment when you realize you could never do this lesson with a laptop. My moment was when we start integrating Twitter with a range of Apps to make workflows easier. This blog shares ideas to integrate iPads into ESL and Literacy classrooms. Also, many ideas can be transferred to content classes and particularly to content classes for ESL learners. Audioboo for National Day Narratives. What am I reading ? Tap here and follow my content creation on Scoop It.